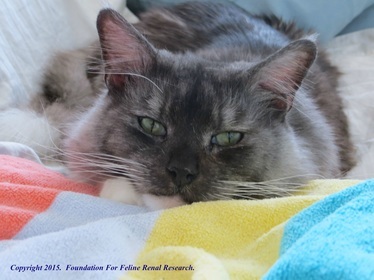 FOUNDATION FOR FELINE RENAL RESEARCH - FOUNDATION FOR FELINE RENAL RESEARCH--Home. Breaking News: We're embarking on a new groundbreaking research study! Please learn more about this exciting new work! "Even as Bucky's body gave out, his spirit never faltered." ​was time. We were devastated. I miss her every day." Bucky and Star are two of the millions of cats whose battle with CKD has ended. Please Get Involved. Be Part of the Progress. Support Feline Chronic Kidney Disease Research Today! “Thanks to the funding provided by Foundation For Feline Renal Research, we are now in a position to use newly developed cutting edge technology to look for gene associations in almost 1000 cats. As far as we know, this will be the first and largest study looking at genes associated with kidney disease and blood pressure in older cats. It's really exciting to be starting new work that we hope will expand our knowledge of both of these important conditions." Dr. Rosanne Jepson, BVSc (Dist), MVetMed, PhD, DipACVIM, DipECVIM. Principal Investigator, “Unravelling the Genetic Basis of Blood Pressure and Kidney Function in the Cat", Royal Veterinary College, London. Kidney Function in the Cat". We're so fortunate that Donut Friend is partnering with us for April, 2019! If you'll be in Los Angeles, CA, USA this month, please stop in to Donut Friend for a Compassion Fruit donut--half the proceeds will support Feline Chronic Kidney Disease research! April 8, 2019: We're happy to announce that we will be participating in Jackson Galaxy's "Cat Camp NYC" on June 1 and 2, 2019 to raise awareness of Feline Chronic Kidney Disease! Please stop by our table--we'd love to meet you! For more details about this exciting event, please check out the "Cat Camp NYC" website. ​a success! We appreciate your support! November 18-2016: Guidestar recognized our commitment to accountability & transparency with their brand new, highest level, Platinum Seal. October 29th is National Cat Day. Please take time to reflect on the great joy that our feline companions bring to our lives, and please donate today to help us find a cure. There are millions of homeless cats. Please consider opening your heart and home to a shelter cat. Be sure not to overlook cats who are elderly, or have special needs; they make wonderful family members, and caring for these special companions is very rewarding. May is National "Hypertension Awareness" Month. High blood pressure is often associated with kidney disease. Current leaders in the field of feline kidney disease research recommend that cats have their blood pressure checked at each veterinary visit. Measuring blood pressure in cats can be challenging, but, if accomplished, the results can provide valuable health information. Ask your veterinarian about measuring your cat’s blood pressure. If your cat is found to have high blood pressure, further investigations should be made to try to determine if your cat has kidney disease as well. APRIL 7TH IS WORLD HEALTH DAY. You can help cats live longer, happier, healthier lives; please make a donation to support kidney disease research today. Approximately 1 of every 3 companion cats dies of kidney failure. You Can Shop For A Cure. "AmazonSmile" is Amazon's charitable giving program. There is no cost to you. Simply click on the button below, and shop; 0.5% of all eligible purchases will be donated to us by Amazon to support our groundbreaking research. FFRR Board members with CNN journalist Jane Velez-Mitchell. 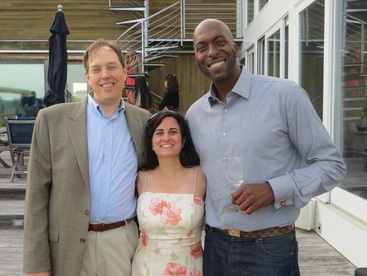 FFRR Board members with four time NBA champion John Salley. 06-22-2013.